I have never seen Steel Magnolias. However, this weekend brought two of its stars to the stages of Nashville, and we saw both of them. Friday night, we saw Dolly Parton at the Ryman Auditorium. It had been over a decade since she played a concert in Nashville, but a local charity brought her back to town. The place was packed with music industry insiders, politicians and regular people. Despite the strange mixture, there was an electricity running through the crowd. This was not just a concert. It was an event. I have written about seeing Elvis Presley in concert, and, although I was young, I can remember a similar feeling. I guess that was fitting because Dolly came out in a white suit that brought to mind something Elvis would wear. Writing a sentence using only first names brought something else to my mind. It is a rare level of fame when people know someone by their first name. Anyway, the show was awesome. Dolly played a bunch of her more famous songs and played a bunch of instruments along the way. However, I enjoyed her stories. She talked about growing up in Appalachia and the struggles that her family faced. She talked about coming to Nashville as a teenager and eventually reaching superstar status. Despite that transition, she never forgot where she came from. Dolly is a true entertainer who writes songs, sings and acts. However, it is her charisma and connection to the crowd that caught my attention. Thursday night, we went to the Schermerhorn Symphony Center for a completely different kind of show. 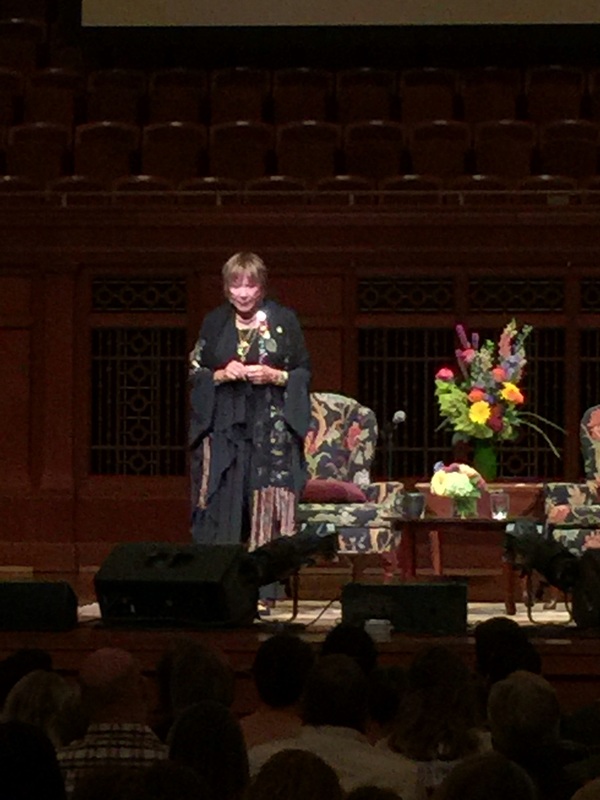 Shirley MacLaine was there to talk about her life and her career. It was also a strangely mixed crowd with those who wanted to hear stories about Hollywood and those who were there to be close to their spiritual guide. I knew that the latter would get what they wanted, but I was hoping there would be more about the inside workings of the movies. It was an interview format with Ann Patchett, author and Nashvillian, doing the asking. I think she wanted to psychoanalyze Shirley MacLaine because the first question went straight to reincarnation. It was something about how playing different lives in movies may have opened her mind to the possibility of living different lives. Well, Shirley MacLaine was having none of that. She knew that she had fought in the Civil War long before she was in a movie. How did someone who grew up in Virginia make it to Hollywood? What did your family think of that decision? Who was your favorite dance partner? I could go on, but I would rather talk about when the audience asked questions. There was a good question about the Rat Pack that led her to talk about the time John F. Kennedy decided not to stay at Frank Sinatra’s house. Then, there was one questioner who said that he could see his deceased grandmother in the eyes of his cat. That led someone else to talk about the hierarchy of the cat world. There was also some talk about how we are living multiple lives all at once. At some point, I told my wife that I was going to the restroom and that I may not come back. People can believe what they want. Heck, I am probably strange, too. However, I had enough mystical talk for one night. Dolly Parton and Shirley MacLaine worked together in Steel Magnolias, which made the two shows kind of cool and connected. As I wrote, the shows were completely different. In one of them, I got up and threatened not to come back. In the other one, I did not want to miss anything. Great concerts. I’ve always liked both women very much. I have a couple of Dolly’s CDs, though none recent. I wish I’d been there. It was something to see. Shirley showed a willingness to talk about some good Hollywood stuff. I just wish she had the opportunity to do more of that. She probably could if she wanted to do talk shows. But she’s been pretty discreet over the years. I’m sure she’s got a lot of dirt on a lot of people, but when she talks, it’s only about herself. Not even her brother. That’s true, but she said some things about Bob Fosse and Marilyn Monroe that were pretty good. I like Dolly Parton’s music. Good to hear she’s still there bright and chirpy!